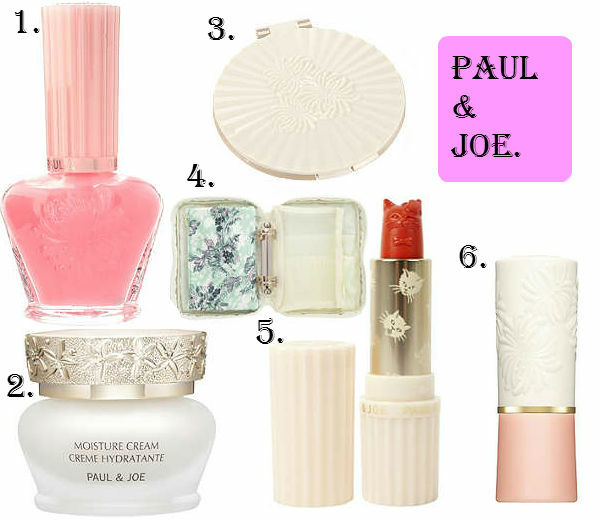 GotToLove♥: Paul & Joe Wishlist. It's my birthday in about 2 weeks -I'm 18 finally- and as I'm going shopping for it, I've been checking out some websites to get some ideas of what I want. I've never been into Selfridges, Space NK or anywhere like that but this shopping trip is commencing in London so I will finally get the chance to! I've just been looking on the Selfridges website and have come across some gorgeous products but particularly Paul & Joe has caught my eye. After seeing Vivanna Does Makeup's recent post which you can see here, lead me to Paul & Joe, and I'm so glad I've found their brand! 1. Nail Base Coat- I've been looking for a decent base coat for my nails, as they just manage to get really stained even if I use a base coat. I've never heard anything good about this, but for only £10 and it's in such a pretty bottle I'm willing to try it! 2. Moisture Cream- Again this is just something I've been needing as I still don't think I've found the perfect moisturiser for my skin. It is scented which I'm always sceptical about, but orange flower and orange oil sounds very appealing! I must admit though that I was only drawn to this because of the detailing on the lid, and just a warning, I chose most of these because they look pretty! 3. Beauty Mirror- I need a compact mirror to keep in my make-up bag and this is just beautiful, it reminds me of the shells that have a pearl in -or oyster shells!-. On the inside there is a mirror on one side and a silver base embellished with a chrysanthemum motif which is just stunning. 4. Floral Make-up Bag- This is such a cool idea, and I can't wait to get my hands on it! It has lots of inner pockets and two removable pouches for any extras! This will be so handy as you can separate your make-up into chucks I have a pretty hard time finding things in my huge make-up bag! 5. Blusher Stick- This is just so cute!! I don't really understand how this could work as a blusher but I suppose that you could just use your finger or a brush to blend it out which would make sense. Again so very cute! 6. Lipstick Case- I don't really need this in my life, but at the same time I really do! It's so gorgeous and would be quite handy to keep your lipstick in, as the top comes of my lipsticks a lot of the time while it's in my bag, which is a nightmare! And for only £5 its a really cute accessory to have. Keep an eye out for a post in a few weeks, hopefully featuring some of these pieces! You can also found these on Paul & Joe's website, I just chose Selfridges as I'm going there. Well I hope you enjoyed this post and liked some of these products as much as me, speak soon becciixx.